ICology is available on Apple Podcasts, as well as many other platforms and apps. Or you can simply listen to the media player above. When it comes to internal communication channels, a lot of attention is paid to email, intranets, enterprise social networks and mobile apps. But despite being around for a while, digital signage often gets ignored or neglected as a vital internal comms tactic. Using Enplug, Meltwater has ensured that the screens in the offices have both a local and global feel to the content. And a lot of this content is also generated by the employees themselves. If you're looking for a refreshed view on digital signage and the positive impact it can have, you'll want to listen to Belén. Paul Barton's "Maximizing Internal Communication"
One of the many screens Meltwater uses to connect employees. Chuck: This is ICology. It's a podcast about interesting people doing interesting things in internal communications. In this episode, I'm with Belen Aleman from Meltwater. If internal comms is your passion, then this is your podcast. Listen in. We've got email. We've got intranets. We've got mobile apps, social networks. They all get a lot of attention when it comes to IC channels, but one that I don't think gets enough attention is digital signage. These are those LED screens your company might have on the walls. I've invested a lot of my career in digital signage, so maybe I'm a bit biased on this, but I think communicators are often quick to dismiss the technology, and this is a mistake in my opinion. When you have really cool technology that merges with great content, the communication opportunities are bountiful. When it comes to digital signage, no one has to click through to see the content. It's not buried in an inbox. The fact that it's passive is one of its strengths, so if you've discounted digital signage as an internal communications channel in the past, today's guest could change your mind. I want to welcome to the show Belén Alemán, Learning and Development Manager from Meltwater. Belén, welcome to ICology. Belén Alemaán: Thanks, Chuck. It's awesome to be here. Chuck: As I've done in recent episodes, I acknowledge that I've completely ripped this intro off of the popular Tell Me Something I Don't Know podcast, but I do it shamelessly, Belen. Here's what I do know about you: You went to school at the Pontifical Catholic University of Argentina, and were also a reporter while there in Buenos Aires, you've been with Meltwater since 2010, joining in Argentina, and have since moved your way up through the organization, including stops in Boston, New York City and now San Francisco. Tell us, Belen, something we don't know about you. Belén: I love to surf and I've been learning ever since I moved to San Francisco, and I fall all the time, but it's such a fun challenge for me. It's something that I've always wanted to do growing up and it just makes me really happy that I'm in a place right now where I can actually do that. Chuck: What is your surfing dream, then? When you think about the future in surfing, what sort of vision do you have in your mind? Belén: I want to look like all of the Billabong models do on top of a board. They just make it seem so effortless and beautiful while riding a wave, which I'm definitely not there yet, but we'll work towards it. Chuck: I have never surfed in my entire life, so you are way ahead of the curve on that one for me. We think that many in communications should be familiar with the Meltwater name but, for those who aren't, why don't you just talk a little bit about the company, the size, the culture. You've been there since 2010, so just get people up to speed on who Meltwater is. Belén: Meltwater was originally founded in Norway back in 2001, and we're a SAS company, so software as a service, and we're focused mostly on helping our clients make better business decisions. We do that by tracking millions of data points on the Web and we bring them back into our software using keywords that our clients choose. Our clients are then able to analyze, report on and disseminate this information to key stakeholders, whether that's external stakeholders or internal stakeholders as well. We're currently around 1,400 employees globally, and our culture is something that we really, really treasure and we spend a lot of time on. We're all about having fun in the work that we do and also working hard to be the best within our industry and to push ourselves always to just achieve more. We also want to do that with a lot of respect for each other as colleagues and also for our clients. That's a little bit about us. Chuck: I'm curious. You sort of made your way, started in Argentina, been in Boston and New York and now San Francisco. Have you noticed little cultural differences in each of those offices? Belén: Yes and no. One very unique thing about Meltwater is that when you walk into one of our offices, it feels like a Meltwater office. We really do strive to live our core values. I have some amazing stories of just colleagues helping each other out in tough times, whether it's work-related or not. That's amazing, just the fact that we have this camaraderie no matter where you are in the world. Yes, of course, the language plays a huge role. Even though we all speak English with each other, we don't all sell, for example, in English. We don't all do business in English. There are those slight cultural differences in that maybe some offices, instead of a happy hour, prefer other activities. Happy hours are very typical in the U.S. but not necessarily around the world. Just slight variances, but not enough to really separate us at all. Chuck: You started out in sales at Meltwater, so what drew you to the roles in internal communication? Belén: I'm a former journalist. I had never planned to be in sales but I did learn a lot. I really do believe that sales and communication are the two most important things for any person that wants to work today in a company. Even though I did learn a lot in sales, it was never truly my passion. I love to write. Like I said, I was a former journalist, so I did want to eventually get back into the communications field. When my CEO reached out to me, almost three and a half years ago now, and asked me if I wanted to join the corporate culture team at Meltwater that he was building, and also have the opportunity to be the first employee dedicated to developing our internal comm strategy, I honestly jumped at the opportunity because I thought it would be a really great transition for me. Chuck: This is a topic that has come up in a past few episodes about the idea of former journalists getting into internal communications. What were some of the skill sets that you had as a journalist that you feel like you've been able to revive a bit now as a daily communicator? Belén: Being curiously engaged, I would say. Basically, internal communications for me is like playing a journalist within the company. I'm the one that has to go out and source information, I have to talk to every department and figure out what they're working on, what's important to communicate. How I communicate that out is also very important, making sure all the facts are there, but then also painting a picture, telling a story. I was able to conduct a lot of interviews with my colleagues all over the world. That's not something we had ever done before and it was a ton of fun and it's just another way, again, to play into how important our culture is, where we suddenly started seeing the faces of our colleagues more than just once a year at the company event. Honestly, I just took on the role of an internal journalist. That's what I would call it. Chuck: One of your big projects was launching a digital signage network at Meltwater, and I kicked off the show by talking about sort of my view of digital signage and it's respect or lack thereof in the world of internal communications. Why did you believe digital signage would make a big difference there at Meltwater? Belén: Take a look at how Meltwater is spread out. We're present in 27 countries and we have over 55 offices. The more we grow, the more challenging it becomes to keep everyone connected. In general, we're also bombarded nowadays with so much information throughout the day on our computers and our phones, that as internal communicators, we always are competing for people's attention. With digital signage, it really gives us an opportunity to be able to call people's attention with minimal effort, to be honest. Like you were saying in the intro, the screens are just there so we can find a way with all of this content that we're already producing to push that on a screen and make it look beautiful and have it accessible instantaneously around the world. That's what's happening at Meltwater and, so far, it's made a huge impact. The feedback that we get from employees is that they do feel more connected to each other because it's not just about seeing company content, they're also contributing their own content, a lot of it that's fun. It helps them feel like they're part of this big Meltwater family that, although we're all so very spread out, we're connected in some way and they feel like they're in the loop. Chuck: Let's dig in deeper into the project itself. Describe how you went about it, the type of content. You said that some of it is employee-generated, which is great to hear, but share some of the other content you put on the screens and also how it's managed. I think you brought up a good point, that a lot of people see digital signage as a great channel for those that are sort of non-desk or digitally disconnected. You make a great point that, clearly, your employees have email addresses, they have computers, they're sitting at desks, they have access but, yet, digital signage brings that visual imagery to life. Describe sort of how you're using this and what it looks like there at Meltwater. Belén: When I moved to San Francisco, which is where our headquarters are, three and a half years ago, we had these humongous LED screens in our hallway and no one was managing them and they looked awful, quite frankly. They didn't work, they were supposed to be touch screen and so much dust had gone into them that they had stopped functioning. I decided to just take it upon myself to figure out what to do with them, because they were quite a big investment. I did a lot of research online for companies that could help us with this and finally we landed on our current vendor, Enplug, who are great. They're very easy to use and they have two essential parts to it. There's a small piece of hardware that connects to the screens and then there's an online dashboard. When I started talking to them, we decided to run a pilot in San Francisco since we had these six large screens. It was great. It was super easy to install. Like I said, I barely had to bother our IT guy, which definitely made his day. Once we were happy with the results here, that's when we started launching to other offices globally. That was also very cost effective, which was something that I was conscious of, my budget, since I was a one-person team, essentially. Some of our offices already had screens, so they used those. Others used TVs because that was cheaper, and others simply had extra laptops lying around. When we talk about digital signage, it doesn't have to seem like this humongous looming project of everyone needs an LED screen. It really can be something as simple as a laptop and this very small piece of hardware. I talk about how easy it is to install because that was also very big. If you think of me as a one-person team and I need to manage this global project, I need it to be done quickly and effortlessly and I can't be there physically to help others out, so that was awesome. In terms of the content, it's all managed through this online dashboard. I have admin rights and I can manage all of the screens globally, but I've also given each local manager access to their own screens so that they don't have to depend on me for content. What we did, so that things wouldn't get out of hand, is that I created what I call just a standard list of content that should be run on every screen. For example, we have an RSS feed of Meltwater's external blog, as well as our internal blog. We have the Today page, which is our internal name for a page where we show sales metrics and overall company KPI's. We also use the screens to stream important product videos and release notes, and then recently I've also started streaming in some employee training materials, especially videos. The most popular feature that we have that I put on the standard list is our Instagram, because we created a hashtag and we call it #meltwaterlife. That's where all employees really get to interact with the screens because when they upload a photo or a video to their own personal Instagram accounts, as long as they include that hashtag in the caption, that photo or video is going to show up in every screen, globally. It's one of the coolest features and our employees love it because, like I said, they get to interact with the screens, they can do it already with their phones which, as we all know, have become extensions of our hands, so it's very easily accessible. That plays beautifully into our culture of just having fun and staying connected and being in the loop of what everyone is doing. Other than that, I let every local manager decide what additional content they want to display. We manage the content through apps that are available on this online dashboard, so it's just a matter of them choosing which app they want to show and then uploading the content to it. It's pretty simple and it looks really good, so it's not like any one of them really has to go out of the way to create this beautiful content to go up there. I've seen offices display things like motivational posters, their own local photos and videos that maybe aren't relevant to the whole company. Some of them, I checked the other day, are using Bonusly, which is for employee recognition. They write messages to recognize each other and those messages are displayed right on the screen, which I think is really cool. Especially in San Francisco and London, New York, Singapore, Hong King, some of our bigger office, we do also use these streams to display welcome messages if we ever have employees or clients or vendors visiting. That's been a really nice touch, especially when clients come to our offices and they see their logo and a welcome message. We've gotten really great feedback on that. Chuck: I was going to ask a follow-up question, but now you've sort of got an interesting new thought in my head. I was going to ask around how much content would you say, if I'm an employee in London, how much of the content would I see as sort of local versus global, but I like this idea, and I've seen it before, with the use of Instagram, in that it's really local content that then becomes global content. Belén: With Instagram especially, it's really cool because in order to activate the app of Instagram on Enplug, you have to sign up with an actual real Instagram account. Each of our offices has their own Instagram account, so they are able to connect that, which will have all of their local photos. Then when they add the hashtag, that pulls in the stream of all the global content that's being pulled together. I would say for Instagram, it's 50-50 in terms of local and global. For the screens themselves outside of Instagram, I would say right now we're at 80-20 global to local. We don't have all of our offices yet using digital signage. We're around 30 right now of the 55, so I am forecasting the more offices that continue joining the program, the more local content we'll start seeing. Chuck: What does success look like for digital signage at Meltwater? You've described a really great visual of this balance between corporate brand messaging, local messaging, social messaging. How have you been able to measure success, say for example, beyond the number of offices that are signed up? What does success look like? 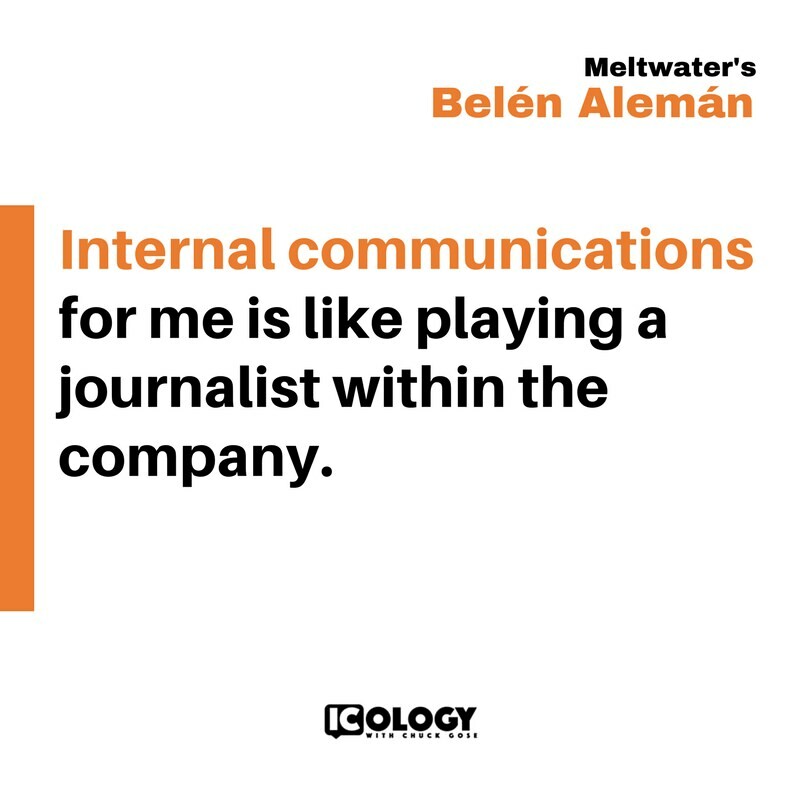 Belén: Because this is still fairly new at Meltwater, I can't really say that I have a lot of statistics or metrics that I've kept up on. It's more of a passive ROI for us. That works at Meltwater. For other companies, that might not work. Other companies may have to prove more value. For us, it was very important to just be able to hear employees talk about what they see on the screens and being excited about it, wanting to contribute content themselves. It's not just through Instagram, that's a really easy example, but all of the local managers that I know get requests from different departments and from department heads, asking us how can we get this content up there so that people can see it, which to me is a huge measure of success. I didn't want this to become something that only I pushed and then it was just there, static and no one really cared about it. One thing that we have really used them for is to show very important product updates and information and, like I mentioned, training content in general. To me, it's important and it is a measure of success to know that employees now count on seeing important content available to them at a glance, and that content helps them do their job better. For example, here at San Francisco headquarters, seeing our executives walking from one side of the office to the kitchen to get coffee and them being able to pass by screens that have Meltwater's KPI's on there, that's huge for us. Even our CEO will stop by. We'll spy on him sometimes in the hallway stopped in front of a screen taking a look at that Today page where we have all the sales metrics. I think that's really cool. That, I measure as successful. Chuck: I think that's a category that people overlook when they look at success, is the anecdotal stuff, the watching people, the feedback you get from people, the requests. That all drives success. Belén: Yeah, and again, I can't stress enough how important our culture is to us. A lot of the programs we launch, especially when it has to do with something more social, like people seeing content as readily accessible and walking by it and chatting about it. If it brings people together, that is successful in our eyes. If I'm walking down the hallway and I hear colleagues talking about something they saw on the screen, a photo someone posted from our new Delhi office, anything like that, I've done a good job, basically. Chuck: You have done a good job. It's a great segue to the next question. What recommendations would you have for others? Like I said, I think that a lot of people like you sort of inherit old networks or stalled networks or there's random screens on the wall that no one seems to lay claim to. What advice would you have for others who are either looking to launch a brand new network or revamp an aging one or one that's stalled? Belén: The first thing I recommend, and that's whether you are looking to launch a new one or revamping an aging one, is that you do some homework to really determine the use and the value that digital signage is going to have for your organization. It's always good to go back to the drawing board because that will help guide the project in general and make sure that you have alignment from executives. This was something that, if it was going to be displayed, it had to look good. Our CEO not only wanted relevant content, but also the aesthetics of it is very important to him. Before I even looked at vendors, I really sat down to think how it would impact my colleagues, how it would work in our office environment, like I said, whether our executives were on board, if it would be a match for our cultures and values. The more you can tie all of this together, the easier it becomes to get people on board with idea. When it comes to vendors, yes, do your due diligence, but I really strongly recommend not settling. Digital signage for some people can seem like this humongous thing, that it's technological and not everyone is savvy with technology, but it really does not have to be complicated. If it seems too complicated or it seems too time-consuming to set up, then keep looking because there are solutions nowadays with our advancements that you should be able to find that just makes things easier for you and for whatever your goals are and not harder. In my case personally, Enplug was a great example of how easy it can be and it is a company that I strongly recommend. It's just been great. I have absolutely no complaints. Chuck: Very recently, you transitioned to a new role, so you're not in the day-to-day function of internal communications there at Meltwater. In fact, you pointed out to me that they have now hired two people to replace you, so congratulations on that. Chuck: Describe your new role and how that came about. Belén: I did, I transitioned to our learning and development team as a program manager and I'm now in charge of creating role and system-specific training content. I'm also the internal communicator for the learning and development team globally. I did ask to keep that little aspect of internal comms. It came about, honestly, because on a personal level, I decided that I want to start pursuing coaching. On a professional level, I felt like I needed to keep expanding what I was doing. Internal comms is a lot of fun, it helped me grow and I just wanted more after a few years in that role. I had some talks internally and a few of us came up with this new role that honestly fits me perfectly. I still get to collaborate on the internal communications side, like I was mentioning, although my focus now has shifted more to representing the learning and development team. I also get to develop new skills in the area of employee training and actually learn about how adults learn and how we apply new concepts once we've learned them, how we apply them at work, not when we're learning in a classroom setting. When we're being trained as employees, it's usually on the job and so there is a difference between how we used to learn in school and how we're now learning at the office. There's a whole world there and for me, it just felt like a really great next step and that would also get me closer to my future goal of becoming a coach. From what I've seen so far - I transitioned in February, so it's still pretty new - but internal comms and then the training and development side really do go hand in hand. As internal communicators, we get to see the needs of the business in a unique way because we are the liaison between many departments and we are the ones that are connecting everyone through the information that we share. What I've seen now as a trainer and instructional designer is that I get to take what I see as missing in terms of skills within the organization, especially in different roles and departments, and then I get to create content that will help my colleagues do their jobs better. I really love it and it really inspires me and it also challenges me. Chuck: Congratulations for getting to design your next role. Chuck: I think that's two things. One, it shows the amount of trust you built within the organization as well as the quality of your work, but now you kind of have no excuses, Belen. Chuck: You've designed this role. Now the pressure's on but, again, based on your past success, I have no doubt that you'll continue to impress there at Meltwater. Chuck: I want to thank you for sharing that advice about digital signage, as well as just a possible transition for communicators, who, maybe they've spent a lot of time in internal comms and, as you said, are looking to expand their impact in an organization, knowing that learning and development could be an opportunity for them, though they may not be able to design or spec out their own job. Chuck: Let's move along to the lightning round portion of the podcast. This is a chance for listeners to learn a little more about you, Belen, so are you ready? Belén: I'm ready. Let's do it. Chuck: A penguin walks through that door right now wearing a sombrero. Why is he there and what does he say? Belén: He says, "Where's my sunscreen? Our cruise leaves in 10 minutes, stop talking to Chuck." Chuck: That's good. Yeah, you don't want to be late for that cruise. What or who inspires you professionally? Belén: Two people, Michelle Obama and Queen Rania of Jordan. I think they're both very strong women and I love the work that they do in the world. Belén: When the person next to me snores very loudly on an overnight flight. I hate that. Belén: Maximizing Internal Communication by Paul Barton, especially if you're just starting out in the IC world. It's very helpful. Chuck: Oh my gosh, Paul Barton's ego inflated just a little bit more. As a past guest and a friend, he will appreciate that, so I'll make sure he's listening in on this episode. Belén: Perfect. Tell him I say, "hi." Chuck: What's a tool that you rely on to make sense of your world? This could be an app, this could be a website, possible even a hammer. Other guests have said yoga, meditation, Spotify. What's a tool that you rely on? Belén: I rely on my planner. I use Danielle LaPorte's Desire Map Planner. I take that everywhere. It's basically figure out how you want to feel and then plan your goals around that for every day. I think it's really cool and it's been very helpful. Chuck: What is the best piece of advice you've ever received, and do you remember who gave it to you? Belén: Yeah, it was actually a really dear friend of mine years ago and he said, "If something serves you, keep it near and if it doesn't, let it go." It's very simple but it does help me recalibrate when I'm stressed. Chuck: What's a final piece of advice that you want to share with listeners? We do have a lot of internal communicators that listen to the podcast. We also just have a lot of business people and leaders who want to get better at communicating, so what's something you want to share with them? Belén: I would share to just be adventurous. Sometimes it is better to ask for forgiveness than to ask for permission, and that's how we all really get to innovate and create something new, which I love and I know most people get a thrill out of it. I would say that, be adventurous and don't be afraid to take a risk. Chuck: Belen, I want to thank you again for being on ICology. This has been such a great episode to record with you. Belén: Thank you. It's been an honor and a pleasure to be with you, especially as a former listener. I'm really grateful for the opportunity. Chuck: Hopefully not just former, hopefully current. Belén: Not just former, current, current, current. Chuck: Visit learnicology.com to catch up on old episodes, get to know guests better, read blog posts and check out events, also all episode transcriptions are available there. Check out the Periodic Table of Internal Communications at elementsofic.com. This is the tool that I co-created with Alan Oram from Alive With Ideas. You can submit elements, dig into elements, print out the table, use it for planning, whatever you want. Again, that's all at elementsofic.com. Follow ICology on Twitter at @learnicology to pick up show announcements as well as other IC news, and if you're not already a subscriber, please fix that. You can listen to ICology on Apple podcasts or wherever you get episodes and, if you enjoy what you hear, it would mean a great deal if you took the time to leave a review.